The American Wind Energy Association (AWEA) is making an all-out effort to convince Congress to renew the wind production tax credit (PTC), the wind industry’s lucrative subsidy that expired at the end of 2013. AWEA is desperate to revive the PTC and, unfortunately, its most recent lobbying push relies heavily on misinformation and half-truths in order to divert attention away from the PTC’s many critics. To set the record straight, this article addresses some of AWEA’s flawed arguments and glaring omissions. The PTC, while incredibly valuable to owners of wind power facilities, hurts U.S. taxpayers and undermines the economic efficiency and physical reliability of the U.S. power grid. AWEA is a well-funded and well-organized industry association with 40 years of experience influencing public policy and an annual budget of more than $30 million. Perhaps due to AWEA’s skilled lobbying efforts, four different administrations and countless lawmakers have sided with AWEA and provided the wind industry a direct hand-out from American taxpayers. Initially signed into law by George H. W. Bush as part of the Energy Policy Act of 1992, the PTC has expired and been renewed multiple times. Each renewal lasted only a short period, designed to extend the industry’s coveted subsidy for just one or two more years. Most recently, the PTC was extended through the 2013 calendar year as part of the “fiscal cliff” legislation passed in early 2013. A PTC extension for 2014 recently passed the Senate Finance Committee after being added to a tax extenders package by one of the wind industry’s most enthusiastic supporters, Senator Chuck Grassley. The Joint Committee on Taxation projects that a one-year extension of the PTC will cost American taxpayers over $6 billion. The Institute for Energy Research (IER) has consistently argued against the PTC and highlighted its negative effects, which range from threatening grid reliability to redistributing federal tax dollars to a minority of U.S. states. Unlike the stable and predictable price of electricity at the retail level, market prices for wholesale electricity can fluctuate widely throughout the day—usually referred to as on-peak and off-peak prices—and across seasons. For example, wholesale prices tend to range between $30 and $50 per megawatt-hour but can drop into the negative or spike well above $500 per megawatt-hour. When the price becomes negative, electric generators are actually paying the grid to take their electricity. Several factors influence wholesale prices, namely supply, demand, and transmission constraints. Fundamentally, negative wholesale prices send a distress signal to markets that the supply and demand balance on the grid is economically unsustainable and suppliers need to reduce their output. Why do sellers not drop out of the market when negative pricing occurs? As the Energy Information Administration (EIA) notes, “negative prices generally occur more often in markets with large amounts of nuclear, hydro, and/or wind generation.” That is because each of these technologies has an incentive to continue operating even when its facilities are temporarily paying the grid to take their power. Nuclear plants are designed to run at full output and not “ramp” up and down, making them very reliable but inflexible. In times of very low demand, nuclear plants will sometimes take negative prices rather than go through the long and expensive process of lowering their output. Similarly, hydroelectric plants sometimes take negative prices in power markets because they are forced to run in order to comply with environmental requirements that force them to release water, regardless of whether the electricity is needed. Unlike nuclear or hydro producers, the wind industry actually profits from negative prices because the PTC is such a large subsidy. Wind producers receive PTC payments per unit of power produced (even when the power has no value whatsoever to the grid), so they flood the grid with uneconomic power and ignore the distress signal sent by negative prices. Specifically, wind producers are paid the equivalent of $35 per megawatt-hour in PTC subsidies, so a wind producer taking the PTC can still profit while paying the grid to take its electricity. Wind’s inflexibility in the face of negative prices is therefore a policy problem with a policy solution (let the PTC expire), not a matter of physics or environmental restrictions. Exelon argues that the PTC wreaks havoc on baseload or “around-the-clock” generation such as nuclear power by encouraging negative prices in wholesale electricity markets. In contrast to baseload units, electricity production from wind peaks at night and in the early morning when electricity demand is low, which contributes to a situation of over-supply. A 2012 study commissioned by Exelon maintains that PTC-related negative prices harm baseload power and grid reliability because they “directly conflict with the performance and operational needs of the electric system.” Essentially, if the PTC is extended, it will induce more negative pricing events during off-peak hours, and make more baseload units uneconomic. In other words, the PTC perpetuates a system of predatory negative prices that attack reliable (and far less subsidized) baseload producers. The power grid reliability implications are straightforward. The PTC is making reliable generation uneconomic, while subsidizing unreliable wind power. Without reliable generation up and running, many regions will struggle to meet seasonal peak demand in winter or summer. For most of the country, the highest peaks occur in the summer months. The following chart from a study on the intermittency of wind power illustrates just how little wind contributes to those summer peaks. On these arguments against the PTC, IER is not alone—energy experts across the board agree with Exelon. The Congressional Research Service (CRS) acknowledged the problem of negative pricing, noting in 2012 that “[n]egative power prices associated with wind power might generally occur at night when wind is producing at high levels. Large amounts of wind power generation can potentially contribute to transmission congestion and result in negatively priced wholesale power in certain locations.” The EIA also specifically lists the PTC as a cause of negative prices. Last December, the New York Times published an article about how wind and nuclear power “are trying to kill each other off” and noted the “cannibal behavior” of wind in power markets. The asymmetry finally hit me over the head when a renewable energy advocate told me that the main purpose of renewable portfolio standards (RPS) was to “kill nuclear”. I had naively thought that the purpose was simply to kick-start renewables. Instead, I was told, because utilities were required to accept intermittent renewable energies, nuclear power would become less economic, because it works best if it runs flat out. 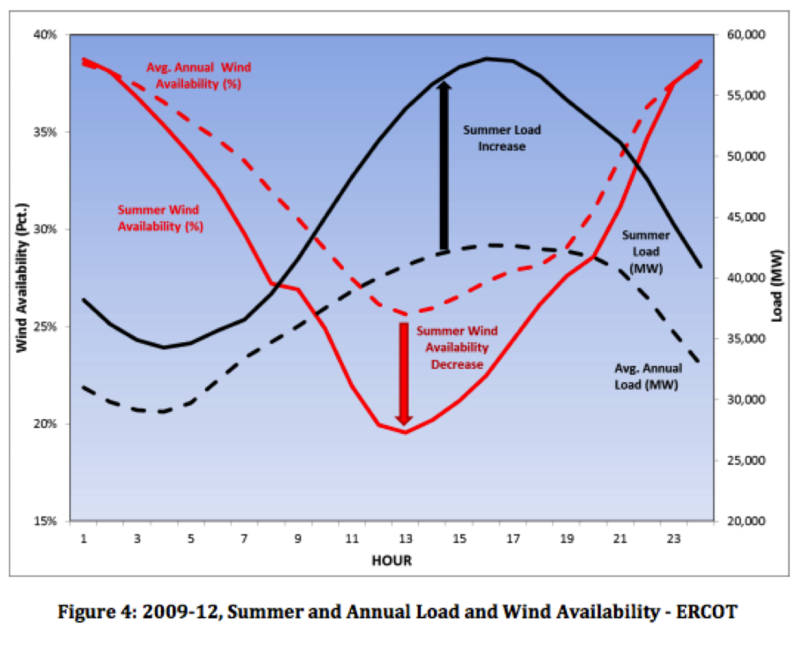 AWEA’s policy report, titled “The facts about wind energy’s impacts on electricity markets: Cutting through Exelon’s claims about ‘negative prices’ and ‘market distortion,’” attempts to turn the negative pricing arguments on their head by narrowly focusing on the wind industry’s side of the story. Specifically, AWEA flatly misrepresents the effect of the PTC on wholesale markets by omitting important information and making bogus comparisons. AWEA claims the impact of wind on wholesale markets is “entirely market-driven” and “widely seen as beneficial.” The first claim is patently false and the second is very misleading. AWEA knows better than any other organization just how much government support the wind industry receives—support that simply does not exist for baseload generation and should not exist for any power generation source whatsoever. Because of AWEA’s lobbying efforts to mandate the use of their product, 29 states and the District of Columbia mandate certain levels of renewable energy generation (these laws are commonly called Renewable Portfolio Standards or RPSs). Because the vast majority of the power being used to satisfy these requirements comes from wind plants, the wind industry currently enjoys a government-mandated market share. This alone is enough to discredit AWEA’s comment about Exelon obscuring the “real story of wind energy successfully competing against more expensive forms of energy in the market.” AWEA knows the wind industry is winning on government support, not the free market. State-level mandates aside, AWEA attempts to downplay the role of the PTC specifically in undermining baseload generation. It is vitally important to realize that negative prices are not the only indicator of market distortion. AWEA draws a false dichotomy in its report between the “real economic savings” from wind and the “exceedingly rare” negative prices that cause market distortions. Here, AWEA downplays the possibility that market distortion can exist without negative prices. But just as the PTC subsidy causes negative prices at the extreme, it regularly causes artificially low power prices in off-peak hours that can be just as damaging to baseload generation. AWEA then makes the stretch that, because the negative pricing problem was less rampant in 2013 than it was in 2012, market distortions from the PTC no longer exist or are “extremely rare.” This argument is fatally flawed as demonstrated by the following analogy. Consider if a thief said, “I didn’t do anything wrong in 2013. I only stole half as often as I did in 2012.” Such a statement would be silly because theft is theft. The same is true of harmful market distortions. Just because there were fewer hours in 2013 with negative prices, it does not follow that the PTC is any less of a problem. Even in a world where prices were never to fall below zero, market distortion caused by the PTC could still render baseload units uneconomic. For example, reliable power plants would still close if prices were consistently at or very near zero. As discussed above, this is what we are seeing in practice, AWEA’s distractions notwithstanding. Also, the 2012 data are so bad that 2013 was bound to be a less damaging year—in fact, one of Exelon’s plants took negative prices for 8.3 percent of all hours in 2012. The fact that this statistic fell to 4.3 percent in 2013 is little consolation. Essentially, we can debate the extent to which the PTC continues to cause negative prices, but to recast the PTC as incapable of distorting power markets is disingenuous on AWEA’s part. Finally and perhaps most disturbingly, AWEA’s report fails to capture any long-term effects of the PTC. For example, in several places the AWEA report talks about wind power “replacing the most expensive and polluting sources of energy.” In practice, wind cannot do this because wind is unreliable. Wind cannot replace the most expensive source of electricity generation because those generation sources only run at peak times. The wind does not blow when AWEA wants it to and millions of dollars spent on lobbying cannot change that simple fact of the physical world. Furthermore, as James Hansen and others have observed, heavily subsidized wind power is actually displacing zero-emission nuclear power rather than the “most polluting” sources AWEA references. If the goal of the PTC was to wipe out America’s nuclear fleet, then it is succeeding. But if the goal was to support zero-emission generation, then it has backfired miserably. The PTC has wasted billions of taxpayer dollars to replace nuclear, a clean technology that works, with one that only sounds good and is fundamentally unreliable. The wind production tax credit distorts power markets by allowing wind producers to profit from artificially low prices. Such market distortion undermines the reliability of America’s power grid in the long run by forcing reliable baseload power plants to close—including nuclear plants, which in turn defeats any environmental purpose for keeping the PTC. AWEA’s recent study is a desperate attempt to obscure the very real and worrisome long-term effects of the PTC by relying on misleading data. The PTC has rightly received scrutiny from energy experts across the political spectrum, and it deserves a more comprehensive analysis than AWEA provides in its report. IER Economist Travis Fisher authored this post.